Oliver Wells' interviews with half-brothers Domanic Charlie and August Jack Khahtsahlano formed the basis for Squamish Legends...The First People (1966), a slim collection published by Charles Chamberlain, proprietor of the Tomahawk Cafe in North Vancouver where August Jack Khahtsahlano's carvings were offered for sale. Primarily concerned with the origins of the Squamish people, this illustrated volume concludes with both men's versions of how the legendary sea serpent of Burrard Inlet (*SAY-nohs-KIY) was killed. 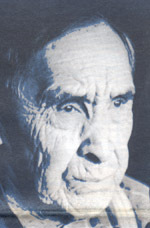 As the son of Jericho Charlie (shin-AHL-tset), hereditary Squamish chief Dominic Charlie was reputedly born in 1866 and baptized near Jericho Beach in Vancouver on December 25, 1885. He worked for August Jack Khahtsahlano booming logs down the Serpentine River, as a boom man at the mouth of the Squamish River, then for nine years in a North Vancouver mill. "He [Dominic Charlie] is a member of the *SKWIY-kway dance Society,"; Oliver Wells wrote, "and continues to practice 'good medicine' as one of the few remaining Indian Doctors with a full knowledge of herbal plant medicine and its use. "; In old age Dominic Charlie was renowned as a weather forecaster. At age 85, he enrolled in Grade One to learn how to read and write. Although his first name was generally spelled Dominic, it was recorded as Domanic Charlie on the book jacket of his only publication. He died in North Vancouver on September 9, 1972. Charlie, Domanic & August Jack Khahtsahlano. Squamish Legends... The First People (Vancouver: C. Chamberlain and F.T. Coan, 1966). Prepared by Oliver Wells.